Legislators are moving to dish out free meals to hungry schoolkids, who are too embarrassed by living below the poverty level to eat free lunches in front of peers. The Hunger-Free Schools Act of 2015 would abolish the current enrollment process of singling out low-income students with paper applications. To accomplish this, SB 334 creates a free meal plan for the entire student body of a qualifying low-income school. The bill already passed unanimously in the Senate and was heard by the House Ways and Means Committee on Thursday. “It alleviates some of the stigma…some students don’t eat because they are ashamed to qualify,” said Del. Mary Washington, D-Baltimore City. The beauty of the bill, according to its sponsor Sen. Richard Madaleno, D-Montgomery, is it would be paid for by the federal government and would have no or minimal impact on the state budget. School systems that qualify for federal reimbursements under the Community Eligibility Program (CEP) meet a minimum of at least 40% of students documented under the federal poverty line. According to Madaleno, this program can be administered on a school-by school basis, or even by combining all county schools (high school, middle and elementary) into one equation. Currently 366 schools in Maryland qualify for the CEP program, and of that number only schools with a low-income level of 55% are likely to choose to participate, which totals 195 schools. There are 150 schools in Baltimore City alone that qualify. “We quickly realized that this program would benefit not only our students but our community,” said John Gaddis, superintendent of Somerset County Public Schools. Somerset County, perhaps the poorest county in Maryland, enacted CEP in all of its 10 schools last year. “In 26 years as an educator, the best decision I ever made was to enroll in this program,” said Gaddis. Somerset County has found the largest percentage of kids not eating in previous years were high school students, too embarrassed to even enroll in a free or reduced meal plan. 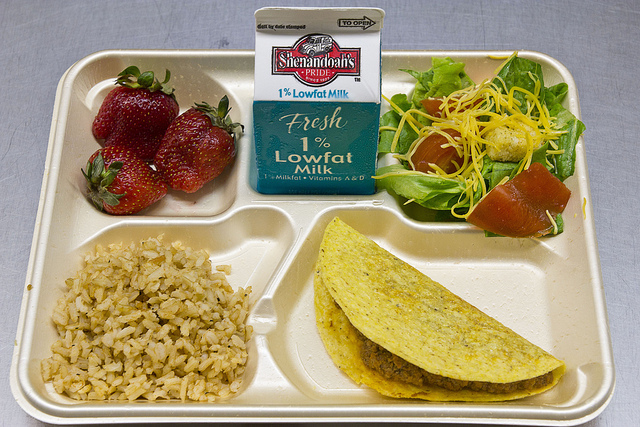 Somerset county schools reported serving 77,037 more meals than last year through the new program. Maddis is learning from local teachers that their students are more attentive and are performing at higher levels than previous years. “We can all agree, when your stomach is growling you’re less likely to focus on benchmark tests,” said Maddis. “Are you worried about being audited? Nobody is in the habit of giving away free money,” said Del. Jay Walker, D-Prince George’s, skeptical of the fiscal impact. The program is technically already in place, thanks to the Healthy, Hunger-Free Kids Act, which was amended the federal National School Lunch Act in 2010. Maryland, like some other states, hasn’t been implementing it fully due to the “administrative burden” of paperwork, Madaleno said. With that taken out, Madaleno believes more and more schools will try to qualify for CEP. The ways to qualify without turning in individual applications will vary based on the school. Districts can choose from a variety of options including using USDA food stamp data, or by using numbers from the previous year. The bill is simply giving students and parents more options. A similar bill passed through the Senate last year but died in the House. Originally presented by the Maryland State Department of Education (MSDE) last year, Madaleno believes the bill is in better shape to pass after his aid in the re-drafting process.